Wroughton has a long and successful history of horse racing stables. Originally wealthy land owners in the area would hold impromptu cross country races to test their horses and risk their money in wagers. 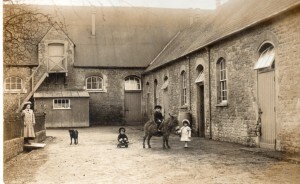 The combination of good livery stables, access to training on the Downs and helped by the good communications provided by the arrival of the GWR railway system in the 1850s encouraged the establishment of racing stables. In 1859 a flamboyant character called ‘Black Tom Olliver‘, who had won the Grand National as a jockey three times, became trainer to racehorse owner, Mr. Carwright, who had set up stables in the High Street at Fairwater House. 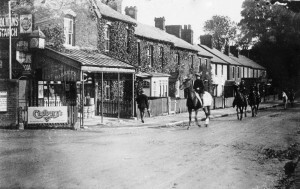 After training many successful horses, including Ely (after whom the public house was named), Black Tom died early in 1874 but later that year George Frederick, named for the future George V, won the Derby to great celebrations in the village. In 1906 Aubrey Hastings, an ex jockey who had also won the Grand National, became trainer at Barcelona Stables and produced Wroughton’s first Grand National winner, Ally Sloper, in 1915. Four more Grand National winners followed from the Barcelona stables, the last being Royal Mail in 1937. Probably Wroughton’s best loved horse was Brown Jack, who had been ill but restored to health at Barcelona stables with a diet which included plenty of whiskey and hot beer. By 1933 Brown Jack had won the Queen Alexandra Stakes at Ascot five years running and now being ten years old he was entered there for his last ever race. George V, George Frederick in his youth, was in the grandstand with his own horse in the field. It is alleged that George V had placed £5-00 each way on Brown Jack. To the delight of the crowd and, of course the whole of Wroughton, he won again, beating the King’s horse into second place. Brown Jack’s fame was such that there is a bronze statue of him at Ascot by Sir Alfred Munnings, a LNER (unfortunately not GWR ) locomotive was named after him, his skeleton is still preserved in the Natural History Museum and, of course, we have the Brown Jack pub in Wroughton. Unfortunately the disruption caused by the Second World War and the construction of the air field, coupled with increased traffic on the roads led to a decline in the horse racing stables and the last one, Barcelona, closed and moved to Kingsclere in 1953, ending nearly 100 years of race horse training in Wroughton. 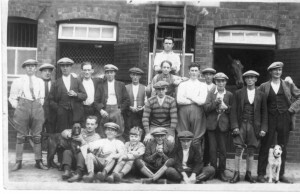 For over one hundred years horse racing activity had been carried on in Wroughton, and in its heyday, the 1920s and 30s, horses were being trained at no less than eight different establishments in the village itself. Why Wroughton? Could it have had its origins with Mr Calley of Burderop Park? We do not really know, but during the appropriate season of each year, Mr Calley would invite his friends to join him to hunt, shoot, course with greyhounds and to race their horses on the Marlborough Downs. At first the horses would be brought to the area annually, but gradually their owners found it more convenient to stable them permanently in the locality. Wroughton must have proved ideal and the village soon became well known among the racing fraternity for the excellence of its training facilities. The following are but a few example of successful horses trained at Wroughton’s two largest stables, Fairwater and Barcelona. Tom Olliver, who had been the finest steeplechase jockey of his time, (having ridden 3 horses to victory in Grand Nationals), arrived at the Fairwater Stables in the High Street in 1859. Here he was to act as trainer for racehorse owner, Mr W S Cartwright. This was to prove to be a winning partnership and Tom, who was known as Black Tom, was able to celebrate many victories together with the owner and the villagers. One of their first very successful horses was “Fairwater”, who won both the Northampton Stakes and the Ascot Gold Cup in 1863. “Ely”, possibly the best horse owned by Mr Cartwright won the Prince of Wales Stakes, the Doncaster Stakes, the Triennial, the Beaufort Cup and then in 1865 he won the coveted Ascot Gold Cup. Little wonder that, Tom Olliver, who had by then become the licensee of the Coopers Arms, should change its name to The Ely. Mr Cartwright liked to name some of his horses after Queen Victoria’s children. Some of these such as “Albert Edward”, “Louise Victoria”, and “Victoria Alexandra” also proved to be winners and brought more prestige to the stables. Tom Leader, who had been born in Wroughton was working at Mr Cartwright’s stud near the village, when he was asked to help at Fairwater Stables. Following the death of Tom Olliver in January 1874 he took over as trainer. One of his most important tasks was to continue the training of “George Frederick” who was to win the Derby that year, just as Black Tom had predicted. Never before had the village of Wroughton witnessed such scenes of jubilation as those which occurred on “George Frederick’s return from the racecourse. Wroughton Brass Band met him at Swindon Railway Station and accompanied him back home to the strains of “See the Conquering Hero Comes”. The trainer and his friends led the parade with half the population of Wroughton following on behind. Mr Cartwright died in 1880 and Tom Leader left the village to set up his own stables in Newmarket, which he named Wroughton House. There were to be several more trainers at Fairwater House but none of them quite achieved the glory that had gone before. Barcelona Stables, situated in The Pitchens, was the other large training establishment in the village. Aubrey Craven Theophilus Robin Hood Hastings, (Who had ridden “Asectics Silver” to victory in the 1906 Grand National), was set up as trainer there by Prince Hadfeldt, the horse’s delighted owner. Among Mr Hastings many successes were no less than three Grand National winners. The first of these was “Ally Sloper”, who, ridden by Jack Anthony was to win this prestigious race in 1915. Lady Nelson, who owned “Ally Sloper” was the first woman ever to have owned a National winner. In 1917, due to the First World War, a substitute National was run at Gatwick, and this was won by “Ballymacad” ridden by E Driscoll. Not to be forgotten our old friend “Ally Sloper” achieved third place on this occasion. “Master Robert” was to complete the trio by winning the race in 1924, having been ridden by Bob Trudgill. “Master Robert” had had a chequered history. Owned by Lord Airlie in conjunction with Sidney Green, he had at one time been put to the plough and used in a dog cart. His skill as a jumper improved so much and so quickly after he arrived at the Barcelona Stables that he was entered for the National. Then disaster struck; just before the date of the race he bruised a bone in his hoof. Frank Cundell, veterinary surgeon of Overtown House, suggested that the best cure for “Master Robert” would be to walk the hard roads of Wroughton without shoes, and this treatment obviously worked. Jack Anthony,(who had ridden “Ally Sloper” to victory), and his brother Ivor (who had been Champion Jockey in 1912) were the stables resident jockeys, and in 1922 Ivor became assistant trainer. After the sudden death of Mr Hastings in May 1929, his widow decided to carry on the business with Ivor Anthony as her trainer, and the stables continued to prosper. “Kellsboro Jack” was to be entered for the National but his owner, Mr Ambrose Clark, was going through an unlucky patch, so Ivor Anthony suggested that the horse should change hands. He was sold to Mrs Ambrose Clark for £1, and ridden by Danny Williams; he was to win the 1933 race in record time. Evan Williams, who had been the stables secretary, rode “Royal Mail” to victory in the 1937 Centenary Grand National. Throughout the years there had been many more successful horses trained at this and all the other stables in Wroughton, but things were about to change. At the beginning of the Second World War, Wroughton Aerodrome was built on part of the gallops. This, plus the increase in traffic which made it more dangerous to walk strings of valuable racehorses through the village, started the decline of the racing industry in Wroughton. Peter Hastings, son of Aubrey assisted Ivor Anthony from 1946 until the decision was made to move the stables to Kingsclere, near Newbury, in 1953. Many felt that when the horses left Wroughton that the heart went out of the village. No longer would the lanes echo to the clatter of the horses’ hooves or the chatter of the stable lads as they made their way in the early mornings or late afternoons to tend their charges. There would now be far less work for the farriers, the saddle and bridle maker and the shoemaker, who had made lightweight riding boots for the jockeys. Without doubt the best known and best loved horse ever to have been trained at Wroughton was “Brown Jack”, but that’s another story.